Space Shuttle Enterprise in the James S. McDonnell Space Hanger in the Steven F. Udvar-Hazy Center near Washington Dulles International Airport. Nikon D700/28-300VR, 1s, f/16, ISO 200, EV 0, 28mm focal length. See Text for More Information about this Photo. 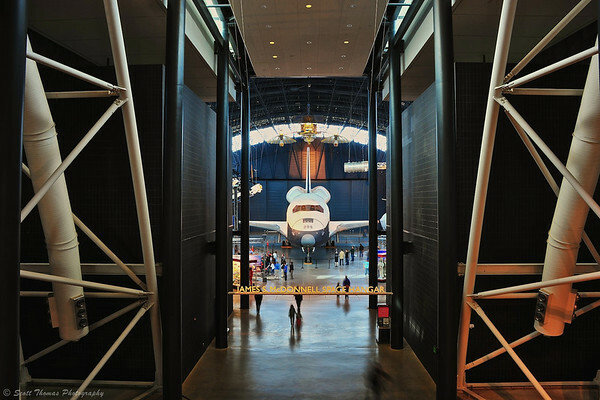 The Smithsonian’s Steven F. Udvar-Hazy Center in Chantilly, Virginia and next door to Dulles International Airport does not allow the use of monopods or tripods due to safety issues. I figured I would have to rely on my Nikon D700 dSLR camera‘s high ISO capability and hand holding ability to get good, sharp photos during my visit earlier this month. That was until I read a post on William Beem’s blog about his visit from a couple of month’s before. Look back up at the photo of the Space Shuttle Enterprise I took from one of the catwalks. Maybe some people can but I can not hand hold a camera for much longer then 1/8th of a second without camera shake of some kind. Even using an image stabilized (IS or VR) lens. The Exif data shows the photo was taken at a shutter speed of 1 second allowing an aperture of f/16 and ISO of 200. Producing a very noise free image with lots of depth of field. The long exposure did show movement in the people below but that’s okay. I could remove them if I wanted to. Scott Thomas with the Manfrotto Magic Arm and Super Clamp. How was I able to accomplish this feat? I used the idea I got from William Beem and bought a Manfrotto Magic Arm and Super Clamp to attach to the railings of the center’s catwalks. The super clamp worked perfectly with the round railings which are at two levels for adults and smaller children. I used the lower railings and the arm had plenty of length to reach up over the upper railing. This gave a secure platform for my camera to be attached to. I used both the Nikon 28-300VR Zoom and Tokina 11-16mm Wide Angle Zoom lenses to photograph the historical air and space craft inside the museum. The catwalks are not rock solid and move when people walk past. I had to use a bit of patience waiting for them to steady. Because this setup was not as good as a tripod I left vibration reduction (VR) on for the 28-300VR lens. The photo below was taken from the seat you see me seating at. The Magic Arm is very easy to position and has a variable friction mechanism. I can loosen up the main joint a little which keeps the camera secure and lets me move it until I find the right angle and re-tighten. I found it very easy to use. 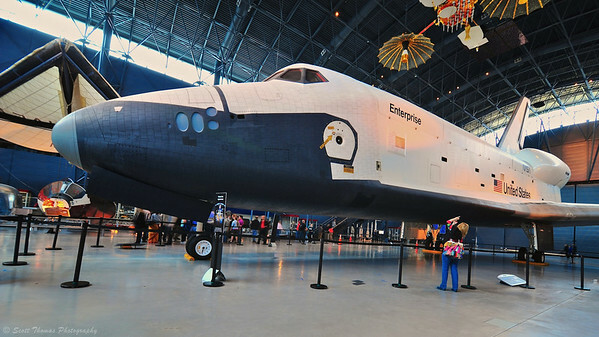 Space Shuttle Enterprise in the James S. McDonnell Space Hanger of the Steven F. Udvar-Hazy Center. Many exhibits had been removed from behind and around the Enterprise in preparation for it to be moved to the Intrepid Sea, Air and Space Museum in New York City. Nikon D700/Tokina 11-16mm, 1/3s, f/8, ISO 200, EV 0, 14mm focal length, Manfrotto Magic Arm and Super Clamp. I would like to thank Michael Besant, who lives in Virginia, for meeting me at the Steven F. Udvar-Hazy Center. Mike, a flickr and Disney friend, was my guide around the museum who pointed me in the right direction after I would explain the photo I was after. He also took the photo of me. Thanks, Mike! The Manfrotto Magic Arm and Super Clamp came in very handy for making bracketed sets of photos for creating HDR images with Photomatix Pro. The hangers where bright at the top and dimmer towards the floor leaving lots of dark shadows below the aircraft with bright highlights above. Especially when the hull was shiny like with the Enola Gay. 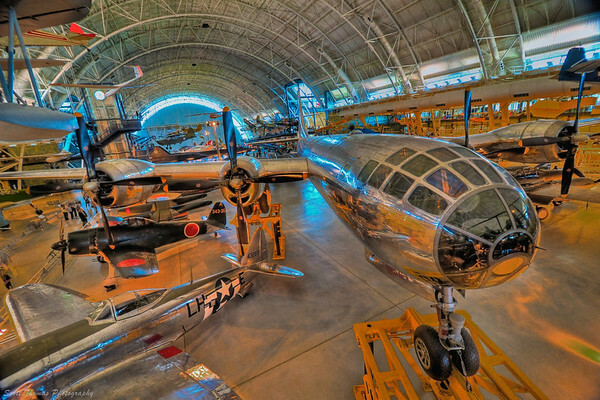 The Boeing B-29 Superfortress "Enola Gay" which dropped the first atomic weapon used in combat on Hiroshima, Japan displayed in the Steven F. Udvar-Hazy Center in Chantilly, Virginia. Nikon D700/Tokina 11-16mm, f/8, ISO 1600, EV 0, 14mm focal length, Manfrotto Magic Arm and Super Clamp, HDR Image. This is the view (see photo below) you first see after clearing the security checkpoint. I am a big fan of the Lockheed SR-71 Blackbirds from my youth. The spy planes could out run anything in the sky and reach almost suborbital heights if the need arose. I sometimes wish we had not been in such a big hurry to get to the Moon and created spacecraft like the SR-71s to reach space. Maybe we will someday. Overlooking a Lockheed SR-71A Blackbird in the Boeing Aviation Hanger of the Steven F. Udvar-Hazy Center in Chantilly, Virginia. Nikon D700/Tokina 11-16mm, f/8, ISO 200, EV 0, 16mm focal length, Manfrotto Magic Arm and Super Clamp, HDR Image. A word about security at the Steven F. Udvar-Hazy Center. The checkpoint at the door never questioned me carrying the Manfrotto Magic Arm and Super Clamp into the facility I used it throughout the hangers and catwalks with no security guards ever approaching me. Not to mention the video surveillance. However, one security guard near the entrance did say I could not use it after taking the photo above. By then I had gotten most of what I wanted. I did use it one more time for the Enola Gay photo, again, without an issue. Be aware not every place you take a Manfrotto Magic Arm and Super Clamp will allow it. It is not a tripod or monopod nor has a footprint of any kind where people could trip on it. Once that is known, I doubt you will have too much problem convincing people it is safe to use. 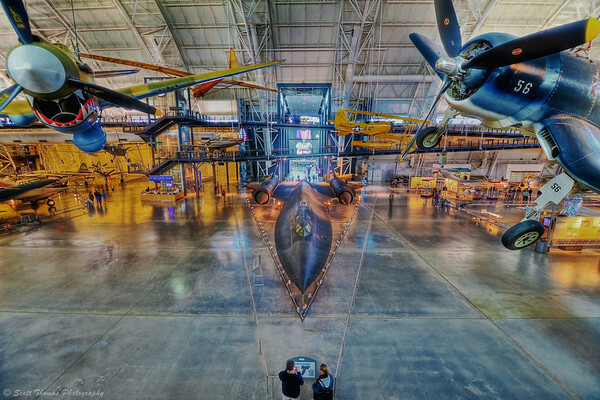 This entry was posted in Photography, Travel and tagged "washington, 28-300mm, aircraft, airport, atomic bomb, blackbird, boeing b-29, chantilly, dc", dulles, enola gay, enterprise, history, lockheed, magic arm, manfrotto, museum, nikon D700, smithsonian, space shuttle, sr-71, steven f. udvar-hazy center, super clamp, superfortress, tokina 11-16mm, uwa, virginia, vr, wide angle. Bookmark the permalink. Nice write up Scott. It was a pleasure meeting up with and showing you a few good spots to get some wonderful shots. I hope I can return the favor some day if you visit my neck of the woods. Interesting “magic arm” – helping you shooting magic photos – at this exciting space and aviation center. It helped a lot. I will be using it in future travels.